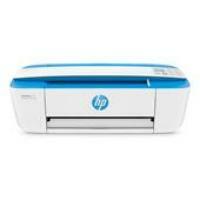 HP Deskjet 3735 Printer is a compact size printer and can fit on your office desk. The printer can print, scan, and copy the documents. The easy-to-move printer has physical dimensions of 142 x 177 x 403 mm with 2.33 kg weight. This mini printer is also suitable for home printing. Monochrome and colour printing speed is 8 ppm and 5.5 ppm respectively. The HP DeskJet 3735 printer is one of the inexpensive printers from HP Deskjet series. For more cost-effective options, the printer uses HP instant ink technology with HP DeskJet 3735 ink cartridges to produce quality output. Multiple-media support and various connectivity options are the add-ons of the Deskjet 3735 printer. The mobile printing includes support of Apple AirPlay and Google Cloud Print and HP’s own ePrint app. The printer allows printing on glossy brochure papers, plain paper, matte brochure papers, photo papers, envelopes, and other specialty inkjet papers. Although, the speed may vary with the type of media. The HP Deskjet 3735 Printer is an inexpensive printer which can print, scan, and copy the documents. This Deskjet printer is flexible and versatile with multiple media types. In addition, the printer allows trouble-free printing with wireless connections backed by apps which include Apple AirPlay and Google Cloud Print, and HP’s own ePrint app. The printer is perfect for basic printing job at home or small office. How to fix poor print quality issues for HP DeskJet 3735 printer? Step 1: For good-quality printouts, use genuine HP DeskJet 3735 ink cartridges. But in case, you prefer using compatible ink cartridges for your HP printer, make sure that you use better quality compatible ink cartridges. Step 2: Check for the ink smears (using printer software) on the back of the printouts. Step 3: For your print job, use appropriate paper. Many papers have printing and non-printing sides. Load the paper print side up in the printer. Load clean, wrinkle-free paper into the printer. Do not use wrinkled or curled paper for your printer. Store papers properly on a flat surface, in a cool dry place and in its original packaging inside a resealable plastic bag. If not, try using another paper for your printing job. Step 4: Check whether your print settings are correct or not. Your printer settings should be appropriate for your print job. Step 5: Check the estimated ink levels. Low ink level may lead to poor print quality. Step 6: Replace any low or empty HP DeskJet 3735 ink cartridge. For aligning the ink cartridge, continue to the next step. Step 7: Align the printer ink cartridges and try to print again. If this issue still persists, follow next step. Step 8: Using the HP software, print a Print Quality Diagnostic page, and then evaluate the results. Step 9: It might be possible that cleaning the printer cartridges improves the print quality. So manually clean the area around ink nozzles. Step 10: If you have followed all the above mentioned steps, but you are unable to resolve the print quality issue, then you need to service your printer. Q. What is the maximum print speed of HP DeskJet 3735 printers? A. The HP DeskJet 3735 printer is not the fastest printer in its class. It is capable of printing black and white pages at a speed of 8 pages per minute and coloured pages at 5.5 pages per minute. Q. Will I have to compromise on quality considering that your compatible HP DeskJet 3735 ink cartridges are cheaper than original ink cartridges? A. Absolutely not! Even though our compatible ink cartridges are cheaper, we do not cut costs by compromising on quality. We use premium quality ink and all our compatible ink cartridges are factory tested and certified to work as well as the original ink cartridges. Q. How is the print quality of HP DeskJet 3735 printers? A. HP DeskJet 3735 printers produce crisp and sharp images and texts. They can print black and white pages up to a resolution of 1200 x 1200 rendered dpi and coloured pages up to a resolution of 4800 x 1200 optimised dpi. Q. How many sheets of paper can this printer handle at one time? A. HP DeskJet 3735 printers can handle up to 60 pages in the input tray and up to 25 pages in the output tray. Q. My printer recently stopped working. However, I am extremely satisfied with the compatible HP DeskJet 3735 ink cartridges and wish to use a printer that can use these cartridges. Are there other printers using the same ink cartridges? A. Yes, there are various other printers that use the same ink cartridges as HP DeskJet 3735 printers, such as HP DeskJet 2634, 3733, etc. You can find the whole list of printers compatible with these ink cartridges on the packaging of your ink cartridge. Q. How long would it take for the compatible HP DeskJet 3735 ink cartridges to be delivered to me in Belfast? A. We deliver the items to our customers within 1 - 3 days. If your order is urgent, you can contact us on 048 30833221 to check stock.